MASKerade: Time Out #68 - Thanks! Time Out #68 - Thanks! I'm so excited to tell you that I have been chosen as a Guest Designer at Time Out Challenges! The theme is CASE with your own twist. To create this card, I started with a watercolour panel and stamped the sentiment, so that I could ensure good spacing and placement of my flowers. To ink my flowers, I used my MISTI and layered different distress inks. I made sure that the stamp was wet before inking it, to help the colours blend on the watercolour paper. I love how you can see the yellows and oranges peeking through the red! I finished the card by adding a gold glitter border and some die-cut dots in matching glitter paper. I hope you'll join us - I can't wait to see how you're inspired by my card! Really gorgeous card Ardyth ! I love the orange-red colors combined with the touch of gold. And the black of your card base just highlights the big Thanks ! Really beautiful design ! I love it. Thanks for sharing and congratulations for being the Guest Designer ! Very pretty Ardyth! 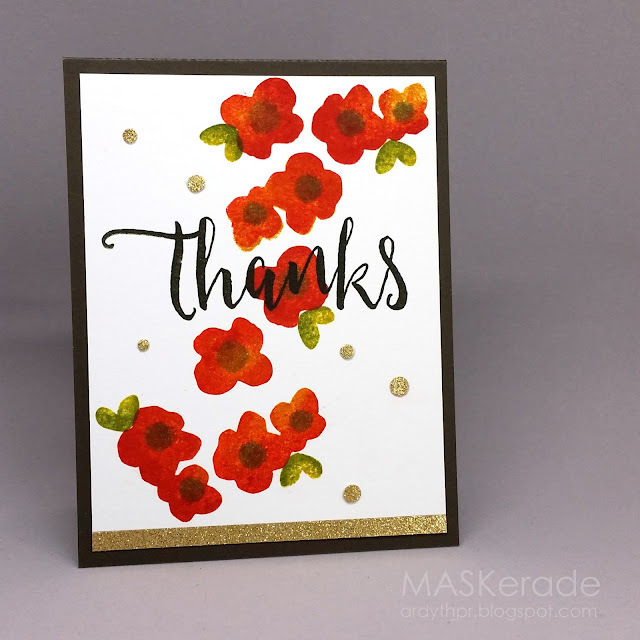 Love your gold strip at the bottom and how the gold is carried through your card design. Woo hoo! Congrats, Ardyth! Hope I get a chance to play along and CASE this pretty card. Congratulations Ardyth on your Guest DT spot, and what a fabulous card to kick it off with! Your card is so beautiful and inspiring. I really enjoyed being inspired by it, and love the card I ended up making. Stay tuned, because I am now on the reminder team. Thanks so very much for being our Inspirational guest designer. Made a card with my very own twist, just because I couln't think another way of using the flowers so perfectly placed as you did :)! Thanks for being our "Casing-designer" at TIME OUT! Congrats on your Guest Designer over at Time Out. Brilliant card, love the style and colours. Congrats on your guest designer spot, Ardyth. I love these flowers. Congratulations on your GD spot! Your card looks so festive with the golden accents! Very pretty! Hope I'll find time to CASE it! The cascading flowers are gorgeous and so is the bold sentiment. This is a gorgeous card Ardyth! The colors just pop off the computer screen! I was so happy to CASE it too! Absolutely sweet card, Ardyth. Thank you for the inspiration!